You can buy balance bikes for children from any age from 18 months all the way through to the age of 10 or 12, so when you are looking for the best balance bike there is a huge range of models, sizes, colours and designs to choose from. However, the most popular age for children to start riding balance bikes is between the ages of 2 and 3, so we thought it would be useful to provide a guide to the best balance bike for 2 year olds. 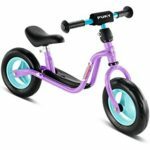 The table below outlines some of the most popular balance bikes for 2 year olds, and we have highlighted the model, the weight, the frame composition and of course – the price! If your child is between the age of 2 and 3 then this is the perfect time to start learning to ride with a balance bike. A normal pedal bike will be too heavy and cumbersome to use at this age – and balance bikes are a lot more fun than traditional tricycles or bikes with stabilisers. One of the main advantages of balance bikes is that they are very light, which makes them easy to manoeuvre for younger children. This also makes them very safe, and easy to clean and transport. If your child is just about to turn 2, then a balance bike is the perfect present for their 2nd birthday! A child that gets to grips with balance and steering between the ages of 2 and 3 is likely to be able to progress to a normal pedal bike by the age of 4. All balance bikes will come with an adjustable seat so that they can grow with your child. However, it is important to make sure that you measure the inside leg of your child and buy a bike that has the correct seat height for them. We have some more details in our Balance Bike Seat Guide. If you are buying a bike for a 2 year old, then you are going to want to purchase a bike with one of the lower saddles, and seat heights tend to start at around 29cm. You need to make sure that the lowest seat height is around 2.5 -3cm lower than the inside leg so that the child can get on and off the bike comfortably. 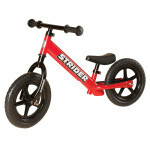 This is why we recommend the Puky LRM Learner Bike and the Strider 12 Classic Balance bike for 2 year olds. These bikes both have adjustable saddles with seat heights starting at just 28cm or 29cm, so these are perfect for this age group. 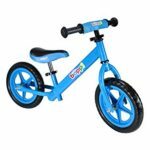 In general, we find that metal balance bikes have more adjustable saddles than wooden balance bikes, so although wooden balance bikes can be painted in lots of fun and exciting colours a metal bike might fit your child better. Some of the balance bikes for younger children also have a special learner bike saddle. 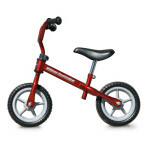 Some of the most popular balance bikes for 2 year olds have a step through frame with a low platform. This allows the child to build their confidence by resting their feet on the platform as they scoot along. 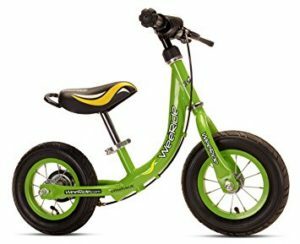 It also makes it easier for them to get on and off the bike, and an excellent example of this is the Weeride First Balance Bike (pictured). This has a higher saddle height than the Puky LRM Learner bike, but it offers a stylish metal frame and a range of colours and it also offers the step through frame. As already mentioned, the majority of the best balance bikes for 2 year olds are made from metal. 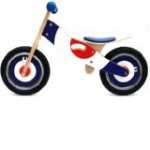 However, if you would prefer a wooden balance bike there are some great choices such as the Jiggy Wooden Balance Bike. This has a great retro design and is very reasonably priced at around £40, and a great alternative is a Tidlo Balance bike which is manufactured by John Crane. These lovely balance bikes are painted in some beautiful colours and wooden balance bikes also have the advantage of being great for the environment. Check out our Balance Bike Tyres Guide for more details on balance bike tyres, but you will find that the choice comes down to traditional pneumatic (air) tyres or EVA foam tyres. Pneumatic tyres have the advantage of providing more ‘give’ so a more comfortable ride, but foam tyres have the benefit of being puncture proof and they are also perfect for younger children learning to ride on smooth surfaces. Strider offer foam tyres on the Strider 12 Classic which we have featured in the table above – although they do offer the option of air tyres on some of their models. The Strider 12 classic also has the advantage of weighing just 3kg which means it is probably the lightest bike on the market! Balance bikes for 2 year old's should also have safety handlebars grips, which are rubber grips with a knobby end to protect little hands and fingers if they run into something – they will also come into play in the event of a fall. There is so much choice for children age between 2 and 3 that there are plenty of excellent bikes even if they are not mentioned in the table above. Your child is likely to be extremely excited at the prospect of riding a ‘real’ bike, and their first balance bike is likely to provide hours of fun and set them well on the way to riding a proper pedal bike.